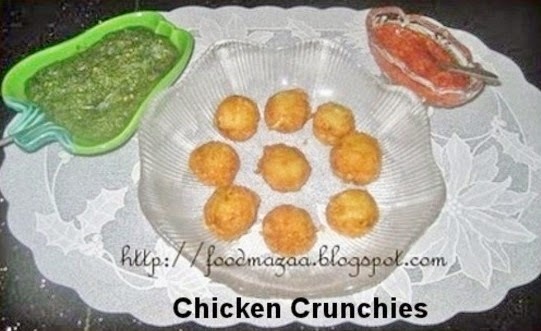 Try out these crispy bite size chicken crunchies.. you will never stop with few. This is a perfect snack for kids parties as well. White flour .............. 1 tbsp. Corn flour ...... 1 tbsp. Cummin powder .. 1 tsp. pepper/white pepper .. 1/2 tsp. or more if you like. 1. Marinate the chicken pieces with all the ingredients and refrigerate until use. 2. Squeeze out a little grated potato in the palm of your hand and cover the chicken pieces firmly. 3. Heat oil and fry these chicken pieces until crunchy. 4. Serve immediately with any sauce of your choice. Feel like having some, yummy crunchies.. True.. they are so addictive. These look like you could just go on popping them in your mouth all afternoon! Yes, they are tiny little poppers.